When is your 100th day of school? 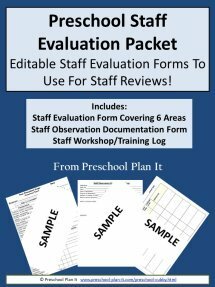 This can be tricky for half-day preschool programs! If your students come to school twice a week during the school year, they will NEVER have a 100th day in school! If they come three times a week during the school year, your 100th day will be at the end of the school year! So, what do YOU do? You could include both classes in ONE count where you count every school day toward the 100 days, which puts our 100th day sometime in January, depending upon days you may be closed for holidays, school breaks and inclement weather. 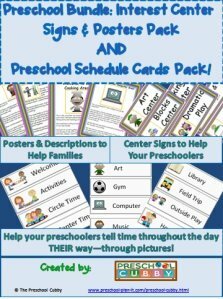 This 100th Day of School Theme page includes preschool lesson plans, activities and Interest Learning Center ideas for your Preschool Classroom! Materials Needed: Finger paint, a large piece of paper (that will fit 100 hand prints on!) and smaller finger paint paper. Provide the children with finger paint and their own paper to enjoy finger painting on. As they come to the table, have them come over and make a few hand prints on the large paper to display on your 100th day. NOTE: Determine how many hand prints each child will make in advance. For example, we have a total of 32 children in our programs combined. We asked each child to place 3 hand prints on the large paper. That gave us 96 hand prints. Each of the teachers and the director also added a hand print bringing it to 100! Provide one brown bag for each child that has 100 dot stickers in it for them to create their own masterpiece with! 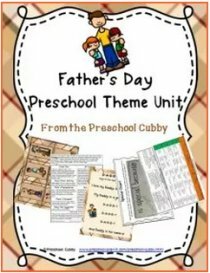 In advance, prepare brown bags (1 for each child) with 100 items that can be glued on paper such as pieces of construction paper, pom poms, etc. The children glue their items on the paper into their own collage. The children make their own scene using the stamps! Add 100 large cups (think red solo cups!) to your block area for building and knocking down! I love this activity! Bring two large pieces of chart paper to circle time and markers. Label one with title "I Would Like 100..." and the title the other "I Would NOT want 100........"
List each child's name in a column on the left side of each chart. After reading a book about 100 (see suggestions in the Library section below), ask the children what THEY would like 100 of! And then ask them what they would NOT want 100 of! They come up with some very funny ideas!!! Each day, choose a different child to add a link to the chain. Print the numbers on the chain first. Recount the chains each day until you get to 100! Collection jar, poster board, name of Service Project (i.e. Pennies for _____) and brown pennies made out of paper that say 100 on them. Decide on a service project where you will collect pennies, like a penny drive. The children bring pennies in each day. At circle, count the pennies as you put them in the jar. Each time you get to 100, place a paper penny on the poster board. Talk about how many times you counted 100 pennies! Tell them how much money that is. Find a brave parent volunteer to take these to the bank or a Coinstar for counting and converting to paper bills and then donate to your charity! Talk to the children about preschool and that they have been coming to school, or that school has been open, for 100 days. Count the numbers on your chart, encouraging them to count with you. Say to the children, "Remember your first day of school? Some of you were nervous, some were excited! Well, my friend here is very, very nervous about starting preschool. 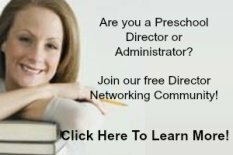 I thought that you could all help tell him what you like about preschool! Because it is 100th day, let's try to come up with 100 things we like about school!" As the children call out what they like about school, write (or have another adult write) them on the chart. You may not fill it up at once circle time and that's okay! Tell the children to let you know if they think of anything else to add to the chart. You can add to it all week! Read the book One Hundred is a Family by Pamela Munoz Ryan. Encourage them to draw a picture of their family. Snack Recipe Ideas to Cook Up for Your 100th Day of School Theme! Materials: 10 different items to add to a snack bag for trail mix (be aware of any food allergies). Place each item in a separate bowl. The children count out 10 of each snack into their baggies! Snack items you could use are raisins, goldfish, M & M's, cheerios, etc. Set up your dramatic play area to be a mini classroom! The teachers can teach the other children or the baby dolls or stuffed animals all about numbers! 100 Leaves (or clouds, or raindrops, or snowflakes, etc.)! After the children have painted (their choice of what they want to paint), give them black paint and a small paint brush. 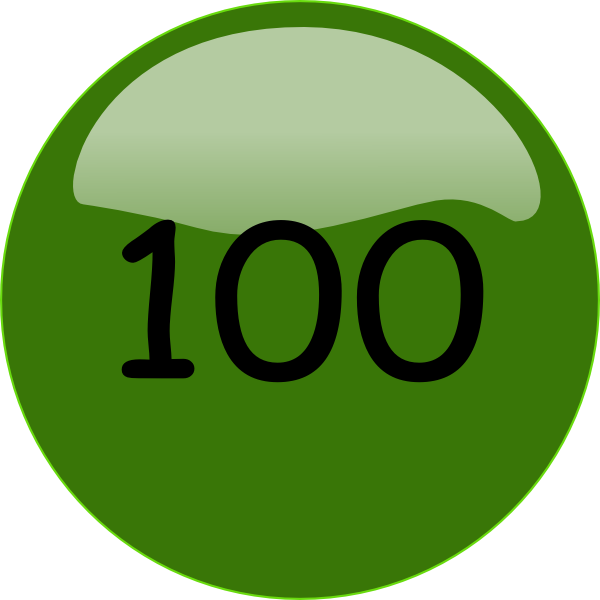 Encourage them to add 100 of something to their picture (raindrops, clouds, spots on an animal, etc.) by dipping the brush in the black paint and counting! Encourage the children to draw what they will look like when they are 100 years old!! Choose 5 exercises to do with the children and do each one 20 times! Now hop on the other! Cut out 100 felt shapes for the children to sort, match and count! 100th Day of School Theme Activities to Help Your Preschoolers Develop Their Math Skills and the Small Muscles in Their Hands! Choose your favorite Bingo game to play with the kids, either in a large group or in small groups at the math table. It could be color bingo, letter bingo, shape bingo, etc. Materials needed: LONG strips of colored construction paper (6 different colors). A wide strip of white paper for the headband part of the hat. Have the children decorate the strips of paper (perhaps with 100 stickers?)! I'd also recommend that the children cut out their own strips! For those children who need it, draw lines where they need to cut with a black marker. Have them print their name on the head band. Attach the strips of paper to the inside of the headband and then arch them over the top to the other side of the head band (there is a picture on my pinterest board...see pinterest link below!). This is great fine motor skills practice! Provide yarn and bags of 100 buttons or macaroni or other items to string into a necklace. In advance, prepare large pieces of construction paper by placing 100 colored dot stickers on each piece. Give each child a bingo dauber to count and cover each dot. VARIATION: Give the children the dots to put on their paper and then cover with the bingo daubers! 100th Day of School Theme Music and Movement Activities and Ideas to get your Preschoolers Movin' and Groovin'! Tell the children that they are going on a scavenger hunt to find 100 items. Tell them that you will name a color and they all have to find something in the classroom that will fit in the box or bin that is the color you name. They should bring the item to the bin and drop it in. Tell them that if the music stops, they have to freeze! Say a color, start the music and say "Go!" Stop the music every now and again! Once everyone drops something in, stop the music and count together. Continue with the next color and repeat until you count to 100! 100th Day Song Sung to "The Ants Go Marching One by One"
We've all been counting one by one hurrah! Hurrah! We've all been counting, one by one hurrah! Hurrah! We started counting up to 10 hoorah! Hoorah! To 20, 30, 40 and then, hoorah! Hoorah! And we're at one hundred. In preschool today, In preschool today. I'm 100 days smarter in preschool today. We've counted to 100, We've counted to 100. We've counted to 100! 100 days today! 100 days today! We've counted to 100. Happy 100th Day! 100th Day of School Theme Activities for the Senses! Place 100 of each size of pom pom that you have in the sand/water table today. Add tongs, spoons and cups. EXTENSION: Add numbers to the bowls or cups and encourage the children to place that number of pom pom in each cup or bowl. Materials needed: playdough, laminated papers with numbers on them and corresponding number of dots. The children roll out the playdough to cover the number with a playdough snake. They then make the corresponding number of playdough balls to place on the circles to count that number. Hide 100 glass or plastic jewels (found at craft stores) in your sand table today! VARIAION: Change the sand out with water and add the jewels. If you have different sizes and different types (glass and plastic), the children can explore weight and sink/float experiments! 100th Day of School Theme Science Activities--for your Preschool Scientists in Training! How Much Water is 100 Ice Cubes? Have the children count with you as you place 100 ice cubes in the bowl. Ask them what they think will happen to the ice as it sits out all day? Discuss. Ask them where they think the water will go to when it melts and mark the bowl with their names and guesses (you can place a piece of masking tape with their name at the spot they guess). Observe throughout the day and discuss at the end of the day. If you have a half day program, check the bowl on the next school day and discuss! Ask children how long they think 100 inches is? Show them a ruler. Show them 1 inch. Tell them the ruler has 12 inches. Now measure 100 inches on your floor or carpet and mark it with tape or chalk. The children use other materials in the room to measure how long this is using blocks, stuffed animals, or other creative ideas ! Set out all your plastic bugs, magnifying glasses some bowls to sort with and lots of books about bugs, including reading the book One Hundred Hungry Ants by Elinor Pinczes! Writing Activity Ideas for Your 100th Day of School Theme! Make copies of a money template or make your own! Have the children cut out rectangles and practice making "100" on the money and printing their names. Provide small pictures of them from your computer for them to glue onto "their" money! 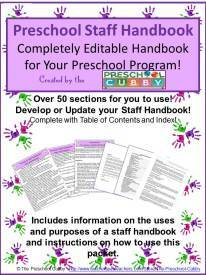 Materials needed: Black paper, white crayon or chalk, glue, brush, glitter, shallow trays. Have the child print the number 100 on their paper (write the number lightly for those who need to trace it). Have them then paint over their number 100 with a paint brush and glue. Have them place their paper in a shallow tray and cover the glue number with glitter, let dry. While drying, encourage them to draw a picture of what they would buy if they had 100 dollars! Write what they say on their paper or let them write their story as best they can (be sure to write i down somewhere also so that you have it to refer back to! There are many people in our local communities that are in assisted living or nursing homes all around the country and the world. Talk to the children about this (some of the residents in these homes are 100 years old!). Some of them do not have family close by or a lot of visitors. Tell them that as a class, they will fill out 100 cards and send them to the residents. Provide blank unlined index cards for the children to decorate. 100 cards will produce 100 smiles! Pretty perfect math if you ask me! 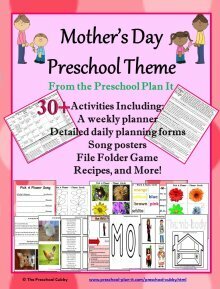 Miscellaneous Activities for Your 100th Day of School Theme! Before you begin this theme, draw the number "100" in block letter form, leaving lots of room for the children to decorate. Give them whatever you like to glue inside the "1", "0" and "0"...stickers, scrap paper, miscellaneous arts and crafts or paint! Use this as a sign over your classroom door on the 100th Day! Hang it over the door, add words so it now says "Welcome to the 100th day of school!". Add crepe paper streamers under the sign that the children walk through to enter the classroom! How about collecting 100 of something that a local community resource could use? Perhaps 100 cans of food for the food pantry, 100 packages (all together) of diapers and wipes for the local women's shelter, etc. At the beginning of this theme (or the week before), send a note home letting families know of your upcoming 100th Day of School Theme. Ask parents to work with their child to come up with an idea of 100 of something they can bring to school! It could be 100 pieces of junk mail, pennies, popcorn kernels, etc. This is an opportunity for families to help their child with rote counting to 100! They may not realize how much 100 is, but this will help! Display their items at a table or your Discovery/Science table with a sign that says "How much is 100?"